How do you make a good thing even better? Add accessories. Accessories make a good thing better. 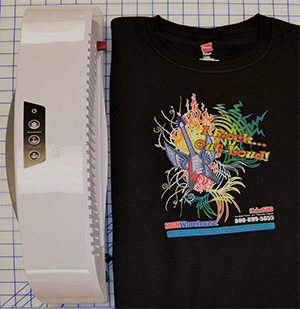 We offer several accessories for heat transfer and t-shirt printing. We now have a new one just for iColor laser transfer printing. The iColor series printers produce their softest and most durable transfers with UniNet Premium Paper. UniNet Premium Paper is a two-step self-weeding solution for decorating dark garments. As the name implies, it’s also the most expensive. Customers working through the learning curve tend to make costly errors. One way to reduce those is with the Uninet Premium Paper hot laminator option. The Fellowes Cosmic2 125 is a hot laminator that uses heat and pressure to seal and protect small format prints and documents. It accommodates sheets up to 12.5″ wide and has heat settings for 3 and 5 mil media. It heats up in five minutes and laminates documents in one minute so it’s quick and easy to use. And the ThermalGuard technology keeps the heat where you want it, so it’s comfortable to your touch. The Cosmic2 is a pouch laminator, but the pouch function is not relevant here. Running your Uninet Premium transfer and adhesive sheets through the Cosmic2 prior to the first step on the heat press drives out any air pockets between the two sheets. It also activates the adhesive layer so that you get a consistently perfect coating of adhesive on the toner. This is the critical element in producing perfect, high quality, sellable and durable T-shirt transfers. It’s available on Amazon.com and elsewhere for about $100. Is it wise to invest an additional $100 to get more consistent transfers? That all depends on how good your process is. If you’re using letter-sized sheets of Premium Paper and wasting 10% of your transfers due to inconsistent adhesive coating, the Cosmic2 will pay for itself after 13 packages of paper or 325 shirts. If you’re using the tabloid size Premium paper and losing 10% of your transfers, you break even at 140 shirts or six packages of paper. Is a hot laminator hard to use? Not at all. Here’s how it works. • Turn on the Cosmic2. Wait a moment for the 3 mil and 5 mil buttons to begin flashing, then press the 5 mil button. When the laminator is ready, it will chime to indicate the desired temperature has been reached. • Place your printed transfer sheet face to face with an adhesive sheet. With the adhesive sheet on top, insert them in the Cosmic 2 laminator. Take care to keep the leading edge flat, especially in the center. The laminator will pull them through automatically. From here, follow the standard procedures for UniNet Premium Paper. You can click here to download the full instruction sheet, along with troubleshooting tips. Here’s the condensed, bullet-point version. • Cover the table of your swing away heat press with a lower platen wrap and Teflon sheet. Place the transfer and adhesive sheet on the table with the adhesive sheet on top. • Peel back a corner of the adhesive sheet and fold it under. This will make it easier to grab the corner and peel it at the end of the heat press cycle. Cover them with a sheet of standard copy paper. • Set the press for 240 – 285°F. Set the pressure to medium to medium-heavy. Press twice consecutively; once for 40 seconds, then for 35 seconds. • Taking care to keep the paper on the heat press table, peel the adhesive sheet diagonally from the transfer sheet. You should have an even coating of adhesive on the printed area of the transfer sheet. • Trim the edges of the transfer sheet to remove any adhesive residue. Place your garment on the heat press and place the transfer sheet face down on the garment. • Increase the pressure to heavy and press for 30 seconds at 285°F. • Allow to cool to room temperature. Peel the transfer sheet from the shirt. • Cover the transfer with a sheet of silicone kraft paper and re-press for 25 – 30 seconds to fix the toner to the fabric. After fixing, wait five seconds or more, then remove the kraft paper and stretch the shirt a little to seal the toner and ensure flexibility. So if you are using an iColor printer and UniNet Premium Paper, all you need to perfect your transfers is one more accessory. There are several hot laminators that will work. The Fellowes Cosmic2 125 is an excellent choice, partly because it’s wide enough to accommodate letter and tabloid size paper. Yes it costs about $100 and it adds about a minute to the process. Is it worth the time and money? That all depends on how many transfers are you losing and how consistent you want your t-shirt transfer production to be.